Batting legends such as Vijay Merchant, Vijay Hazare, Vijay Manjrekar, Polly Umrigar, Lala Amarnath, Sunil Gavaskar, Gundappa Viswanath, Mohinder Amarnath, Dilip Vengsarkar, Kapil Dev, Navjot Sidhu, Ravi Shastri, Mohammad Azharuddin, Sourav Ganguly, VVS Laxman, Virender Sehwag, Rahul Dravid and many more have served the nation with their superb batting. The little master, Sachin Tendulkar, is at the end of his international career and is supposed to be the best batsman in the world to have scored mountains of runs in all formats of the game. India is currently enjoying the services of youngsters who have replaced the old guards. Gautam Gambhir, Yuvraj Singh, Rohit Sharma and Shikhar Dhawan are performing perfectly with the willow while MS Dhoni is leading them from the front. Virat Kohli has emerged as the wall of Indian batting in the recent years and has become a nightmare for the bowlers all around the world. 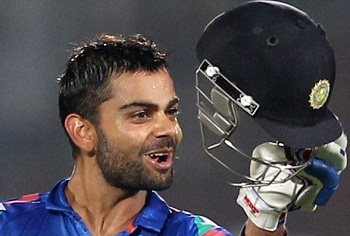 Virat Kohli was born on November 5, 1988, in Delhi, a right hand top order batsman and a right arm medium fast bowler. He has played for India, Royal Challengers Bangalore, India Under-19’s, India Red and Delhi. The 24-year-old believes in aggression and never allows the rival bowlers to take command of him. He loves challenges and rescues his side when they are in hot soup, especially while chasing. Kohli started his international career against Sri Lanka in the One Day International on August 18, 2008, at Rangiri Dambulla International Stadium. He had to wait for almost three years before he was inducted in the Test side against West Indies on June 20, 2011, at Sabina Park, Kingston, Jamaica. 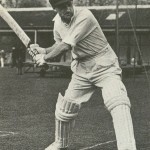 The right hand batsman has appeared in 18 Tests and scored 1175 runs at a reasonable average of 41.96, the best of 116 with 4 hundreds and 6 fifties. He took part in 21 Twenty20 games and managed 587 runs averaging 34.52, the best of unbeaten 78 with 4 half centuries. Virat Kohli is the king of the ODIs on the international circuit and holds the top position in the ICC rankings. He has played 119 matches and blasted 4919 runs at an awesome average of 51.77, the best of 183 with 17 centuries and 26 fifties. He is the fastest ever player to grasp 17 hundreds in the history of the game. The master blaster led the Blue Shirts to quite a few commanding victories with his 16 tons and most importantly, 11 of them were achieved while chasing and that too with a brisk run rate. 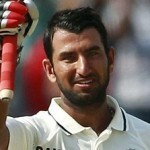 He has solved the problem of no.3 batsman for the nation and will serve for a long time to come. The smart guy from Delhi was the second highest run getter for India in the recently concluded ODI series (2013-14) against the visiting Australians. He thrashed 344 runs in five innings at a superb average of 114.66, the best of unbeaten 115 with two hundreds and even fifties. There is no match for the little master in the world of cricket but definitely Virat Kohli will be another thriller on the cricket fields and will break a lot of records during his international career.